As I discuss in my EBook: The 50 Ugly Truths about starting your own business …and why you should do it anyway,… the way of the entrepreneur is not for the faint of heart. Chances are you clearly see a problem in a market you know, and you set out to solve it with your product or service solution. 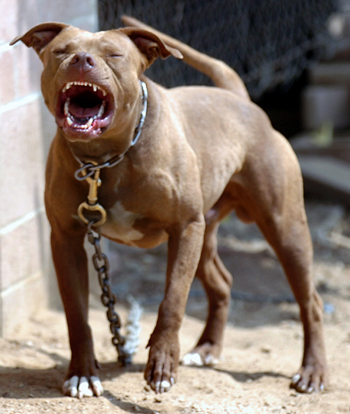 One characteristic all entrepreneurs possess is the tenacity of a Pit Bull. Are you a “Pit Bull” or a “Poodle”? 1. Do you have a definite purpose backed up by a burning desire to see it fulfilled? 2. Are you continuously in action working on your plan? 3. Is your mind closed towards all negative and discouraging influences from foes, “friends,” dysfunctional parents, music, books, tapes, T.V. etc? 4. Do you hang out with people who are greater than you in what they have accomplished and who utterly challenge you to excellence? 5. Are you self-reliant and independent? 6. Do you take responsibility for your life, both failures and successes? 7. Do you hate it when you waste time? 8. Do you look at life as a game to be played and played like a champion? 9. Have you become impervious to the criticisms of pusillanimous men and women? 10. Do you boldly face your fears with faith and move towards your goals? 1. Do you often complain about your life? 2. Do you avoid association with people who have accomplished more than you? 3. Does your life seem futile and your future hopeless? 4. Do you often feel self-pity? 5. Are you envious of those who excel you? 6. Do you worry a lot? 7. Are you overly cautious and negative? 8. Are you indifferent and lacking in ambition and enthusiasm? 9. Do you constantly use excuses and alibis to explain why you haven’t accomplished anything? 10. Do you often fantasize about lying on the front passenger seat of a Cadillac with a pink ribbon in your hair with your favorite chew toy? Ok, no one else is around….how did you answer the above? You must be real with yourself. Not everyone is cut out for the entrepreneurial game and that’s ok. Some people are much better as soldiers than generals leading the charge. Some people intentionally chose not to risk letting any of the key plates drop and they serve teams. The above questions are a great filter to guide you to see if the entrepreneurial game is for you. As I recommend in my EBook make sure you enter this game with a clear understanding of what this role will entail and you have realistic expectations for performance and cash flow. So how about you…are you a pit bull or a poodle? In your current role what should you be? If you are in a role that requires a pit bull and you find yourself a poodle, what should you do?